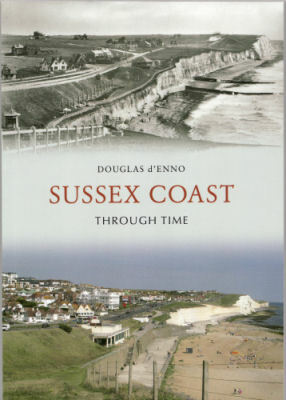 In Sussex Coast:Through Time, local author Douglas d’Enno presents a new and very interesting exploration of the ninety miles of Sussex coastline. The rich variety of the physical aspects of this line of coast have clearly been presented previously in other publications. But this new book explores the coast from a social perspective, and that is its strength. The volume contains many rare early images which are presented with their modern counterparts and described with meticulous attention to historical accuracy. Vanished landscapes and buildings, including 1930s swimming pools, holiday camps, elegant hotels and even the site of a murder are among the unusual and strikingly contrasting pictures of this unique county. Visually this book is a rare treat, historically it is most informative. It will appeal to a wide range of readers from social history devotees to walkers.